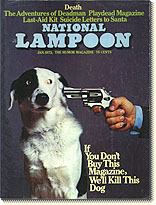 My initial glance at Fannie Mae's annual report reminded me of the classic National Lampoon magazine cover that showed a dog with a gun to its head and said "If you don't buy this magazine, we'll shoot this dog." Upon seeing the testimony, it is clear that I had gotten the animal wrong. One Congressman, who gave every appearance of reading his questions from a cheat sheet provided to him by Fannie Mae, straightened me out on this one. It's not a dog; it's a horse. And the horse represents the U.S. economy. The undercurrent of the hearings was clear: No matter what awful things Fannie Mae might have done, if there is any chance that even a single low-income individual will be unable to buy a home because of sanctions placed on Fannie Mae, it is imperative that we look the other way. Furthermore, the very real possibility exists if we lay so much as a finger on Fannie Mae, it will take down the entire U.S. economy with it. The scariest thing about the televised hearings is not what appeared on them, but what did not appear—the written testimony of Roger Barnes, a financial accounting manager at Fannie Mae. His testimony, which I never saw discussed at the hearings, alleges that Fannie's management used ham-handed financial manipulations to inflate Fannie Mae's reported earnings (and its managers' bonuses). I could go on for weeks, deconstructing Fannie Mae point by point. I could even make the deconstruction entertaining for my readers who go in for that sort of thing. But anything that I might write would be sheer speculation. And it does not have to be that way. Hey, they don't even have to make them available to everyone, just to me. Drawing on past experience, if I dropped everything and started dissecting Fannie Mae today, I could give them a clean bill of health in six to nine months. And I'm sure my MBA students would love to help—that way they can get out of predicting Google's stock price will do for the month of November. If Fannie is hiding the "black hole" that some on Wall Street believe it is, the job could take as little as six to nine hours. And, if they don't have financial models, the whole thing could take six to nine minutes. In the likely event that Fannie (or its board) does not take me up on this offer, I will continue to watch them and take copious notes on the nearest available object. From a safe distance. And away from surveillance cameras. And I'll write happy commentaries that won't offend anyone. Something harmless. Like alien abductions. That's the ticket. So, stay tuned next week for "Alien Abductions and Your Financial Future." P.S. This commentary represents my opinion. Don't shoot me; I'm only the piano player.